We still repair Minitor III, IV, and V pagers! Trade In and Save on leading edge MOTOTRBO™ radios and repeaters Save up to $1250 with trade-ins! Click here or call Candice at 828-251-1243 for promotion details. 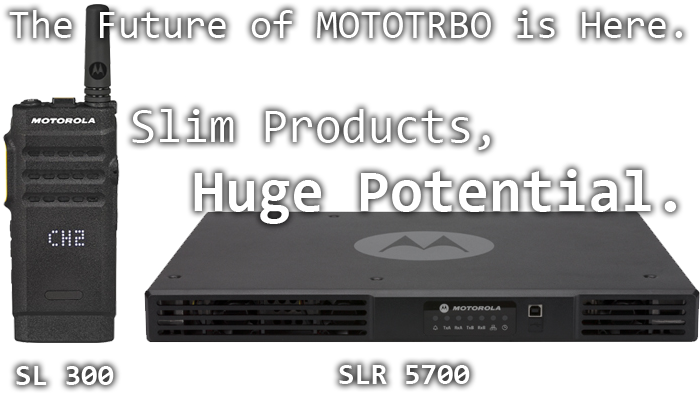 Click here to browse our lineup of radios, including the lightweight new SL300 portable radio, and the incredibly slim SLR 5700 1U rackmount repeater. For information on radio features and pricing, or radio repair, installation, and service, please contact our knowledgeable sales manager candice at 828-251-1243, or stop in at our downtown Asheville location. MOTOROLA, MOTO, MOTOROLA SOLUTIONS and the Stylized M Logo are trademarks or registered trademarks of Motorola Trademark Holdings, LLC and are used under license. All other trademarks are the property of their respective owners. 2019 Motorola Solutions, Inc. All rights reserved.